A lease protects you from misunderstandings on either side. We've put together some guidelines to take the mystery out of your lease and to help you decipher the pertinent information. 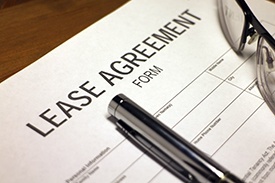 Your lease is a legal contract, which means that each side agrees to mutual consideration. In exchange for rent, you receive the use of an apartment. Make sure the lease states your monthly rate and due date along with any penalties for late payment. Most landlords require a deposit, so it should also include the amount, what it covers and how you get it back if you move. It's no fun to come home to an apartment with no water or electricity. The lease should outline which side is responsible for utilities. You can almost always plan on paying for Internet, cable and phone. What is Your Term of Residence? Leases can be offered in various monthly increments. Your lease should indicate the start and end dates along with the policy on month-to-month terms and how much notice is required before moving. Be clear on these details, as breaking your lease can trigger some costly penalties and fees. Most people move into an apartment with the intention of living in it themselves, but if there is even a slight chance you may want to sublease, make sure it's allowed and if so, what the terms are. This issue has become more relevant with the popularity of Airbnb and other private lodging organizations. Note: While you may not expect to sublease, there is a greater possibility that you may choose to take on a roommate. Check the policy on roommates and whether or not another party can be added to the lease at a later date. Before you start painting the walls or mounting your big-screen TV, find out what modifications are and are not allowed. Some may be expressly forbidden, while others may be permissible with a one-time fee upon move-out. Our Springs communities are pet-friendly, but that's not always the case elsewhere. Don't assume that your furry friend will be allowed to move in with you. The lease will state the pet policy as well as any additional deposits, fees or monthly charges that may be required. Once you know what to look for, your lease won't seem so scary. Still have some questions? You don't have to go any farther than our Springs leasing office, where a friendly and knowledgeable member of our management team will be happy to help you.